Nikol Pashinyan, Armenia's Prime Minister, came to power off the back of paralysing campaign of street protests in April-May 2018. Photo: Yaghobzadeh Rafael / ABACA / ABACA / PA Images. All rights reserved.In April, Armenia’s government was overthrown. Weeks of strikes and civil disobedience paralysed the country until leader Serzh Sargsyan had no choice but to step down. But Armenia’s Velvet Revolution, as it has come to be known, was much more than just a change in government. It was and continues to be a cultural transformation. Having overthrown the Republican Party regime that held power for nearly two decades, Armenians are realising that other hopes – which had once seemed completely impossible – are perhaps within reach. Armenia’s post-revolutionary government has done little to dampen these expectations. Led by Nikol Pashinyan, the dissident journalist and politician widely seen as the leader of the revolution, the government has painted itself as post-ideological and representing nothing less and nothing more than “the people” – with few concrete policies in between. And this vagueness, in tandem with post-revolutionary euphoria, has transformed the new government, and “Nikol” as Pashinyan is popularly known, into a blank screen onto which all manner of Armenian society’s hopes are projected. To be sure, these hopes are multifarious, often contradictory, and usually deep-seated challenges to the old order that are not easy to put into action. In the spa town of Jermuk, these feelings have now coalesced into the country’s first post-revolutionary crisis: a confrontation that pits local residents against an international company and the long and corrupt legacy of mining in Armenia. 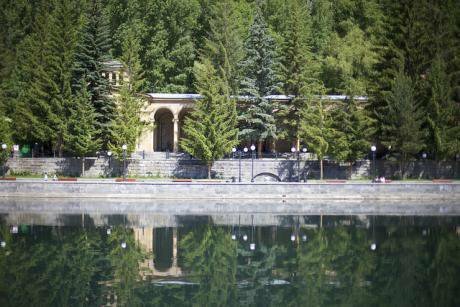 Jermuk, some 170 km southeast of the capital Yerevan, was founded atop its hot springs in 1951. During its Soviet heyday, thousands of visitors would come every year here to rest and recuperate from all the domains under Moscow’s control. Jermuk. Photo CC BY-NC 2.0: Raffi Youredjan / Flickr. Some rights reserved.Like many of Armenia’s provincial towns, Jermuk began to decline sharply with the collapse of the USSR. Sky rocketing poverty, closed borders and a war with Azerbaijan devastated the tourism industry. But not all was lost: even as the airport shut down and some of the grandest sanatoriums were abandoned, visitors still came to Jermuk. In the 2000s, the town enjoyed a partial renaissance with the opening of new hotels and influx of international visitors (primarily diaspora Armenians and Russians). Though wracked by poverty and unemployment, Jermuk remains one of Armenia’s touristic gems. Immediately after Armenia’s revolution in April and May this year, the town rose up in revolt against a local gold mine. For years, concerned local residents had struggled with the company that runs the mine, but the conflict had never before reached fever pitch. The revolution, it seems, is changing the balance of power. The Amulsar mine, located just several kilometres from the town, is owned and operated by British-based company Lydian International. At the time of the revolution, it was nearing completion. Today, the mine’s once deafening construction yards lie silent. The four entrances to the mine are blocked by protestors who keep watch day and night. 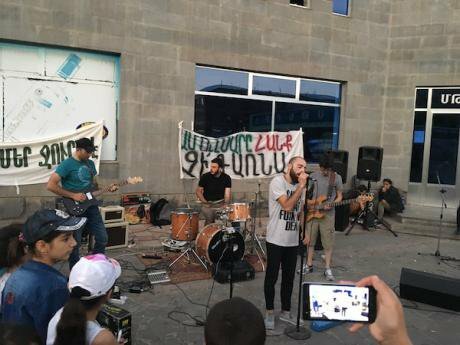 Meanwhile, a propaganda battle is raging between the mining company and the protestors – and Armenia’s post-revolutionary government faces its first major crisis. Blockpost at Amulsar, Jermuk. Photo: Knar Khudoyan.The fate of Jermuk, the company, and perhaps much of Armenia itself hangs in the balance. Lydian International was incorporated in 2007 in the British corporate tax-haven of Jersey. It began exploratory processes near Jermuk that same year, and so far, the Amulsar mine has been its only active project. 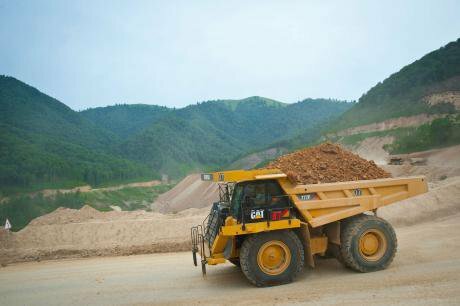 The mine has a storied history, with several environmental safety and social assessments (ESIAs) being submitted and approved through the years, the latest in 2016, following which construction began in earnest. But even before full-on construction began, tensions began to rise around the mine – with some local residents and environmental activists coming out against the mining company. 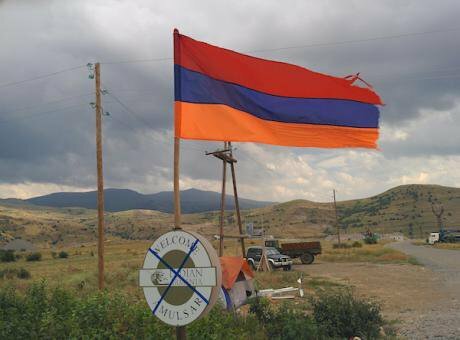 The first major problems emerged in the village of Gndevaz, just south of Jermuk. The apricot groves of a number of residents were located on land that was to be the site of the mine’s heap-leach facility (a structure which utilises cyanide to separate gold from ore). The same year the ESIA was approved (2016), the Armenian authorities changed the status of this land, to be used for the future heap-leach facility, from agricultural to industrial. Residents reported that they were pressured by the company to sell their groves. In effect, residents were given the choice of selling their land or having it expropriated by the state (for Lydian’s purposes) under the auspices of “public need” – an act previously carried out by the local authorities in Yerevan for private real estate developers. The prices offered per tree differed for young and old apricot trees. Ultimately, the greatest beneficiaries of Lydian’s buy-out were the wealthiest and most established residents of the village. Gndevaz village, Jermuk. Photo: Peter Liakhov.The tensions in Gndevaz were only the beginning, however. Environmental organisations started to publish information about the ecological threat that the mine posed to surrounding communities, and residents who were once either disinterested or even excited about the mine began to fear for their future health and livelihoods. Although the fervour of the present-day controversy around Lydian International may make it seem like the company was always hated by residents of Jermuk, Gndevaz and Kechut (another village just to the south of the resort town), the company initially enjoyed a warm reception. Aharon Arsenyan, now one of the key protest leaders, recalls how happy he was when he first heard about the mine opening and how excited he was to personally apply for a job at the company. Lydian created a great deal of public relations fanfare when it first arrived, claiming that not only would the mine be completely environmentally safe, with “no water discharged into the surrounding environment without proper treatment”, but that it would bring jobs and development to the region and the country – employing 1,300 people during construction and 770 people during its planned 10 years of operation, while also making a total of $488m of future contributions to the state budget through taxes and royalties. This rhetoric was also matched by effusive praise from the British and American embassies. For instance, US Ambassador Richard Mills made the following comment during a visit to Amulsar in 2015: “The Amulsar project is an excellent example of what is possible when our countries and peoples work together.” But over time, amidst this torrent of positivity, a less rosy picture of the mine began to emerge, and once construction began, the relationship between locals and the company quickly turned bitter. Amulsar mine, Jermuk. Photo: Knar Khudoyan. All rights reserved.In 2015, as the date of mine construction neared, Armenian environmental NGOs ArmEcoFront and Ecolur (among others) began to publish a slew of articles and documents vociferously opposing the optimism of Lydian International. They pointed out that the Amulsar Mine is located within stone’s throw of two of Armenia’s largest and most strategic water reservoirs: the Kechut reservoir (4.5km away from the mine) and the Spendaryan reservoir (six kilometres away). These reservoirs not only sustain the agriculture in the Vayats Dzor region. The Kechut reservoir is directly connected to Lake Sevan through the Arpa-Vorotan tunnel. Any toxic discharge from the mine, therefore, would endanger not only the immediate area, but Armenia’s largest freshwater lake – its single most valuable hydrological resource. This was only compounded by more nebulous though still troubling claims regarding the presence of radioactive material at the Amulsar site. A paper published in 2007 in a Russian scientific journal argued that there could be significant amounts of uranium located at the Amulsar site. Lydian International and the previous administration of the Government of Armenia disputed the validity of the article, citing tests conducted by Lydian that apparently showed negligible amounts of radioactive material at the site. But matters were somewhat complicated by the identity of the article’s author: the late G.P. Aloyan, a geologist who had worked on research expeditions to the Amulsar mountain in the 1980s, was also the father of Hayk Aloyan, the managing director of Lydian International’s Armenia operations. In addition to the environmental risks, local residents also began to see the mine as anathema to their old way of life. Lydian had not included Jermuk in its initial ESIA reports, and when it finally did in 2016, it acknowledged the social impacts of the mine beyond simply “jobs”. Specifically, Lydian pointed to the inescapable fact that the nearby mine would significantly alter the social dynamics of Jermuk, calling it the four m’s: men, money, mobility and mixing. The influx of monied single men would lead to a concomitant increase in prostitution and similar mining-town “ills”. This was in marked contrast to the bucolic and family-friendly tourist atmosphere the town had long cultivated, and would in its own way come to pass as construction of the mine neared completion. All this said, nothing much changed as the years rolled along. Resentment may have simmered below the surface. Beyond the immediate region, Lydian’s position seemed almost unassailable and construction of the mine continued. Still, weaknesses began to show in Lydian’s narrative. Slowly, the company began to lose control of the story – and along with it some of its key allies. Armenia’s mining history has been uniformly terrible, with corruption and environmental destruction plaguing many of the over 400 mines in the country. But Lydian used this legacy to its advantage, advancing the narrative that they were not only different, but would stand as “an example of responsible mining in Armenia, and will bring tangible, direct, and lasting economic benefits to the country”. To this end, they marshalled the fact that Amulsar was the only mine in Armenia to have received investment both from the European Bank of Reconstruction and Development (EBRD) and the International Financial Corporation (IFC) – investments that are, at least on paper, attached to strict social and environmental requirements. It is important to note that these two organisations’ work is marred by several controversial projects. The IFC is dogged by international controversy over other mining projects, and the EBRD, in addition to international controversy, has been involved in financing of the Deno Gold Mining Company – a company implicated in the failure of the Geghanush tailings dam, near the southern Armenian city of Kapan. 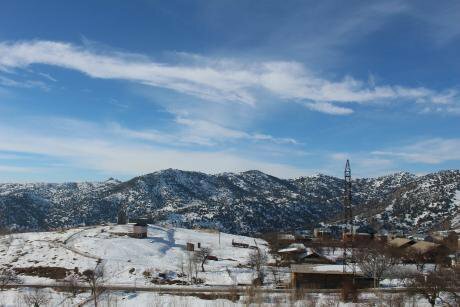 The IFC even acknowledged some of the problems with the Amulsar mine in 2017, when the IFC ombudsman’s office finally replied to a complaint launched by several Gndevaz residents. The ombudsman concluded that many of the mandatory public consultations from 2009 to 2016 were insufficient and that the dangers facing communities near the mine were understated. A significant number of consultations that took place were “informal” and “ad-hoc”, while “risks and impacts” with associated mitigating measures were “beyond those (...) contained in the current ESIA”. Perhaps most importantly, the report concluded that the “IFC does not have assurance that potential impacts on Jermuk’s brand as a tourist center have been assessed and mitigated” with the IFC’s internal requirements. Mining trucks at work at the Teghut Mine in Armenia's northern Lori province, closed in February 2018. Photo CC SA 3.0: Sara Anjargolian / Wikimedia Commons. Some rights reserved.Several months after the publication of this report, the IFC pulled out of its partnership with Lydian International. The letter explaining this decision did not criticise Lydian, and in fact commended the company, stating that the IFC’s investment was simply no longer necessary. However, as Fidanka McGrath, an analyst at international financial affairs watchdog Bankwatch, told us, this behaviour appears to be “uncommon and an exception” to how the IFC normally operates, especially in light of their public plans to deepen cooperation with Lydian, and may have been a result of them losing trust in the project. In any case, the evacuation of the IFC removed one of the key elements that Lydian had used to justify the mine’s positive presence in Armenia. It was not long after that the EBRD’s relationship with Lydian also took a hit. Another major mining operation in Armenia connected to the EBRD was the Teghut Mine, which was financed through loans from an EBRD funding recipient, the Russian commercial bank VTB, which in turn made loans to the mine’s parent company: Vallex Group. Vallex made their initial pitch for the mine in a similar tenor to Lydian, claiming to open a new chapter for responsible mining in Armenia. And the mine, which began operations in 2014, counted as investors both the EBRD and the Danish National Pension Fund. In 2017, the Pension Fund divested from the mine. Shortly afterwards, Vallex Group announced the closure of the mine and decision to lay off more than one thousand workers. Another important connection between Teghut mine and Amulsar is their parent companies’ mutual work with consulting firm Global Resource Engineering (GRE). GRE has authored three technical reports for Lydian and, according to its principal environmental engineer Larry Breckenridge, has also worked with Vallex Group in a “consultant/advisory role” for 18 months – though when he wrote to us, he could not discuss anything further due to a confidentiality agreement regarding all GRE work at Teghut. As of July 2018, GRE no longer lists Vallex Group as a client on its website (it does however still use a photo of the Teghut Mine as the background on that very same webpage). That said, there is one important distinction between Vallex Group and Lydian International that should be mentioned. The former (similar to many other mines in the country) is owned primarily by a domestic oligarch (in this case Valeri Mejlumyan), while the latter is a fully foreign-owned entity. Harout Bronozian, a US-based Armenian chemical environmental engineer, first learned about the Amulsar project in 2014 when Lydian representatives held promotional events for Armenian diaspora communities in Los Angeles and New York. Bronozian, an engineer by profession, immediately had reservations about the project. In his view, the mine’s location precluded it from safe operation: located, as it was, so near to several of Armenia’s key water resources. However, Bronozian did not feel that he could accurately assess the risks of the mine, and did not trust the environmental materials presented by Lydian. He turned to independent consultants, hiring Buka Environmental, Blue Minerals Consultancy, and Clear Coast Consulting, who would analyse the data (provided by Lydian) and make a new assessment. As he put it to us: “I don’t want to believe the environmentalists, nor the company or anybody else. I wanted to see geochemically what kind of responses I can get.” And just like that, he found himself on the frontlines of the propaganda war raging around the Amulsar mine. 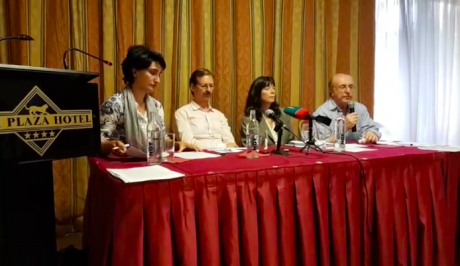 23 June 2018, Dr Ann Maest and Dr Andre Sobolewski hold a press conference at Plaza Hotel, Yerevan, introduced by Harout Bronozian (right). Source: YouTube. The report published by the Bronozian consultants landed like a bombshell in January 2018, galvanising the mine’s opponents, and triggering a withering response from Lydian and its own consultants. The report primarily reiterated the dangers that had already been raised by the environmentalists, but it also raised one new claim: the greatest danger of the Amulsar Mine was a phenomenon known as Acid Rock Drainage (ARD). This occurs when sulfide-rich rock dug up during the mining process comes into contact with water (e.g. rain or snow) and, as a result, generates acid which flows into the surrounding environment. ARD, if unchecked, would increase the acidity of surrounding bodies of water, making them barely habitable for aquatic life and useless for agriculture for hundreds of years. The root of this problem lies in Lydian’s mitigation methods for ARD: their primary method is a process called “encapsulation”, whereby acid-generating rocks are literally entombed within a structure of non-acid-generating rock, and are thus prevented from coming into contact with rain or snow. However, the Bronozian consultants claim that after examining the data, the process outlined by Lydian was insufficient to prevent ARD. In June 2018, two of the Bronozian consultants flew to Armenia and visited the mine site under Lydian’s supervision. Following this visit they delivered a press conference where they stated that they had adjusted their conclusions. Given the new information, they now understood that there were no non-acid generating rocks present at or near the Amulsar site, and that encapsulation was thus completely and utterly ineffective. As a result, they claim they were told that Lydian would use different mitigation methods, which in the view of the two Bronozian consultants were unreliable and “experimental”. Even if Lydian has been losing the information war, it had a reliable partner in the previous Armenian government, which not only greenlighted the mine, but was also willing to expropriate private lands and even change legislation to suit Lydian’s needs. For instance, in 2015, Armenia changed the maximum allowable ramp gradient for haulage roads from 7% to 10%, thus allowing the company to reduce operating costs by approximately $100m. But after Serzh Sargsyan and the ruling Republican Party were overthrown in April-May this year, Lydian’s position has become more precarious. Not only have they lost their staunchest ally, but opponents of the mine have been emboldened and are now armed with tools that they believe could deliver them victory. In late May, in the immediate weeks following the revolution, the residents of Jermuk, led by the youth that had left for and returned victorious from Yerevan, began the first steps in mounting an organised public resistance to the Amulsar mine. Protest in Jermuk. Photo: Knar Khudoyan. All rights reserved.On 25 May, they held their first public meeting, a gathering of roughly 70 people from Jermuk, Kechut and Gndevaz in an old school house in Kechut. During this meeting the people assembled discussed what should be done about the mine; the dangers they had learned about; and whether they could trust the new government. There was no direct voting, and there were no official leaders (everyone present at the meeting were meant to be complete equals). Instead, it was a slow (yet often loud, argumentative and deliberative) process of generating consensus. Issues of vice also arose. People told stories of mine construction workers not local to the region coming into town getting drunk, starting fights and driving dangerously after having taken license plates off of their vehicles. Local residents, who said they’d never locked their doors before, reported feeling unsafe. After a loud few hours, a conclusion was finally reached: they would wait and see what the new government would do. Though wary, the attendees of this meeting had found trust in Nikol Pashinyan. In the meantime, on 26 June, the new government announced a working group to investigate every single mine in Armenia, including Amulsar. But even with an investigation looming, construction at Amulsar was not halted, and as the mine entered the final stage of construction, local residents started to become restless. For the next several weeks, spontaneous blockades momentarily emerged, briefly halting construction, and were occasionally met with counter-blockades by Lydian workers who blocked the main thoroughfare to three resisting communities. Blockpost at Amulsar. Photo: Knar Khuodyan. All rights reserved.Another meeting was called in short order. This time, over 500 people attended (a great number for three cities whose collective population is roughly 7,500 people). They decided that they could no longer wait: the mine could not be allowed to reach completion. A series of organised blockades staffed by volunteers and supported by local communities would halt construction indefinitely. The blockades were organised as four “posts” at each of the entrances to the mine, crewed by a rotating cast of volunteers. The protestors, primarily veterans of the April War of 2016 and Karabakh War of the 1990s, borrowed much of their practices and terminology from their military service, emphasising their “military discipline” and calling shift-changes “changing of the guard” in interviews. This was part of a greater conceptualisation of the protest itself as a patriotic act – an important frame after the brief, but bloody resurgence of the conflict between Armenia and Azerbaijan two years ago. Babo, one of the young protestors whom we spoke to, put it as follows: “Our friends died defending a piece of our land (Nagorno-Karabakh), we are here so they didn’t die for nothing.” In fact, it seems likely that this patriotic conceptualisation of the clash between the mine and local communities explains another strange development: roughly half of the protestors that we spoke with were, until the blockade began, contracted mine construction workers (and on paper, still remained as such). When asked to comment, protestor’s replies often shared a common sentiment: a choice between one’s homeland and the promise of a paycheck is no real choice at all. The blockades have remained in place for over a month now, and their endurance is a testament to the popularity of the cause in the region. Nearly every car that drives past honks in approval. Passersby often stop to offer the protestors food, drink, cigarettes and gasoline. Some have even donated tents so protestors can sleep more comfortably. As the protestors have settled in for the long haul and the mine shutdown for an indeterminate amount of time to come, the new Armenian government is quickly becoming a major player, and though there were initially doubts from the anti-mine campaigners about its role, right now the feeling at the blockade seems unanimous – a victory that had seemed impossible to them before, now looks to be at hand. It is clear that with Armenia’s low annual budget and already high level of state debt (58.8% of GDP), a costly settlement with Lydian would deliver a significant blow to the country’s economy. On the other hand, Pashinyan’s legitimacy as revolutionary and patriot is at stake. How would it look, after all, for police to repress idealistic protestors (veterans, no less) using the peaceful tactics of the revolution? And perhaps most importantly, how can Nikol Pashinyan navigate this issue without harming international investor confidence in the new Armenia? Nikol Pashinyan at 6 July meeting, Jermuk. Source: Youtube. The answer to this question remains to be seen. But when Pashinyan arrived in Jermuk to mediate a meeting between protestors and Lydian on 6 July, it seems that his view of the situation had changed. In a raucous televised meeting, Pashinyan called for calm and constructive dialogue, and again called for space to be given to the government to investigate the matter. 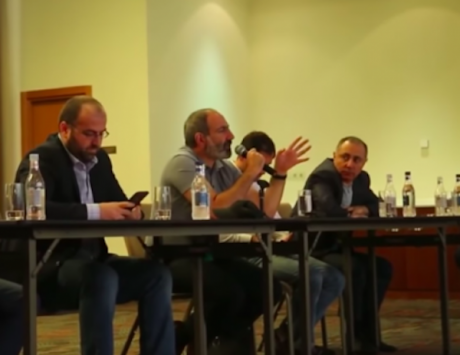 Pashinyan asked Lydian’s CEO if he could give a plausible timeline that would allow the Armenian government to conduct an investigation into claims about whether the company is operating in accordance with Armenian law. Lydian’s newly appointed CEO João Carrêlo refused to give this timeline, claimed that the construction delay has already cost the company $26m and counting, and stated that any investigation would have to run parallel with ongoing mine construction/operation. On 24 July, Nikol Pashinyan confirmed the members of the working group that will investigate the Amulsar Mine. It is being spearheaded by Artur Grigoryan, a long time environmental lawyer and a former legal counsel of several Gndevaz residents who launched an administrative suit against the Amulsar Mine. Other members include members of the affected local community (including Aharon Arsenyan), environmental experts and members of Lydian who were explicitly selected as not having been contributors to the company’s previous Environmental Safety Assessments. The working group is due to begin their work imminently. But the perhaps the biggest recent development in the controversy around the Amulsar Mine has been the announcement by the Special Investigation Service of the Republic of Armenia (SIS) that a criminal case was being pursued in regard to the mine. This follows an allegation made to the SIS that the pre-revolutionary Ministry of Nature protection “willfully concealed” information from the Armenian population concerning the dangers of possible pollution from the Amulsar Mine. The saga of the Amulsar mine looks like its entering its final act. As the new government is fully turning its gaze towards the mine and protestors man the barricades, Lydian International finds itself in its most precarious position yet. And perhaps there is a certain poetry to that fact. The eponymous Amulsar mountain where the mine is located, has had its name for as long as local residents can remember – it comes from the Armenian word “Amul” or “barren” because no crops would ever grow on its slopes. It seems that barrenness may extend to what is beneath the soil as well. When Lydian arrived in 2006 it sought a gold-rush. Now it may very well leave Armenia empty-handed.